Form CT-4852 or the "Substitute For Form W-2, Wage And Tax Statement, Or Form 1099r, Distribution From Pensions, Annuities, Retirement Or Profi T-sharing Plans, Iras, Insurance Contracts, Etc." is a form issued by the Connecticut Department of Revenue Services. 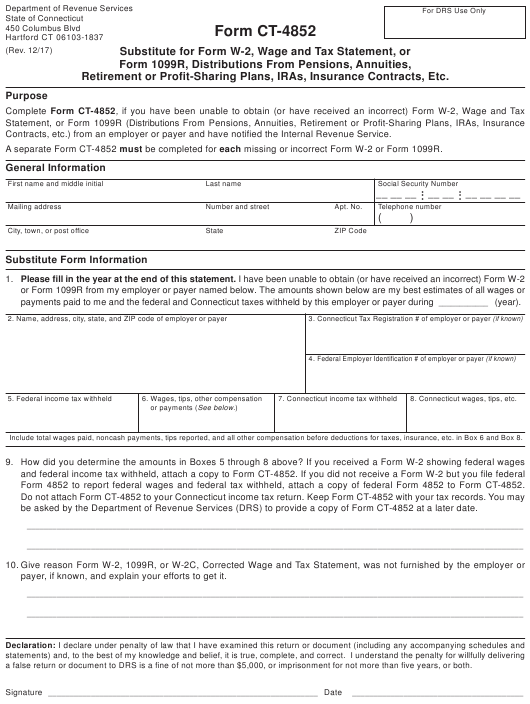 Download a PDF version of the Form CT-4852 down below or find it on the Connecticut Department of Revenue Services Forms website. Retirement or Proﬁ t-Sharing Plans, IRAs, Insurance Contracts, Etc. Contracts, etc.) from an employer or payer and have notiﬁ ed the Internal Revenue Service. A separate Form CT-4852 must be completed for each missing or incorrect Form W-2 or Form 1099R. 8. Connecticut wages, tips, etc. Include total wages paid, noncash payments, tips reported, and all other compensation before deductions for taxes, insurance, etc. in Box 6 and Box 8. Form 4852 to report federal wages and federal tax withheld, attach a copy of federal Form 4852 to Form CT-4852. be asked by the Department of Revenue Services (DRS) to provide a copy of Form CT-4852 at a later date. payer, if known, and explain your efforts to get it. a false return or document to DRS is a ﬁ ne of not more than $5,000, or imprisonment for not more than ﬁ ve years, or both.